A mixed organic fruit bag containing generous quantities of approximately nine different varieties. A typical bag could comprise: apples, pears, oranges, bananas and melon. The contents vary each week according to season and availability. Suitable for 2-4 people. 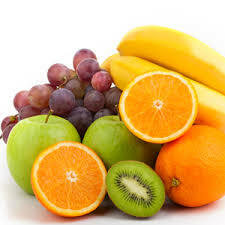 An assortment of approximately six varieties of organic fruit which will vary according to season and availability. A typical bag may comprise: apples, bananas, oranges, pears, melon and plums. Suitable for 2-4 people. A mixed organic fruit bag containing generous quantities of approximately five different varieties. A typical bag could comprise: apples, pears, oranges, bananas and melon. The contents vary each week according to season and availability. Suitable for 4-6 people. An assorted bag of approximately five varieties of organic fruit which will vary each week according to season and availability. A typical bag could comprise: apples, pears, bananas, oranges and a melon. Suitable for 1 person.